Digital transformation not only affects production and industry but it has also inspired the media and event industry for several years. Developments such as VR, UHD/4K or Over-the-Top services make for new and profitable business models, yet they increase the pressure for innovation. All new media standards have one thing in common: they require new flexibility in content transmission as well as bandwidth that cannot be realized with the usual digital technology. Copper-based systems still define the routines in studios and in event technology. Meanwhile, the future is going IP-based with scalable fiber optic infrastructures that can rise to the new challenges of media technology. In the future, comprehensive application of fiber optic systems will belong to the basic skills of imaging engineers and event technicians, defining the daily routines. Optical fibers overcome the strict distance restrictions of copper systems, they transport nearly unlimited bandwidth and they have high signal stability with minimal transmission latency. New fiber optic technologies, such as bending optimized fibers or Expanded-Beam connectors facilitate the use and increase the reliability of image and sound transmission systems in realtime live applications. How does Fiber Optic Data Transmission work? Transmission in an optical fiber is based on light, an electromagnetic wave. Similar to a wave in water, light spreads in all directions in a straight line. In addition to visible light (380nm-780nm), the spectrum of this electromagnetic wave also comprises ultraviolet and infrared radiation. The preferable wavelengths for data transmission of 850 nm, 1300 nm und 1550 nm are not in the visible range. The mentioned wavelengths are also called first, second and third optical window. The selection of these wavelengths is based on the specified minimal loss in optic fibers. A glass optical fiber consists of an ultrapure glass core that is covered by a glass cladding. For mechanical stabilization of the fiber, the cladding is coated with plastic, the primary coating. How does Fiber Optic Signal Propagation work? How does the Fiber Structure influence it? Signal propagation in an optical fiber is based on the physical principle of total reflection: If a light beam passes from one medium to another, the beam is refracted or reflected depending on the angle of incidence. Incident light waves from the core material onto the cladding material are either absorbed (1) or reflected (2+3). The angle at which refraction changes to reflection is called critical angle of total reflection (2). Only total reflection (3) is useable for data transmission. a. What is Numerical Aperture? In order to use total reflection in an optical fiber, the angle of incidence must not be below the critical angle. This means that the beams’ angle of incidence at the abutting face must not be exceeded, which results in an acceptance range for incoming beams. 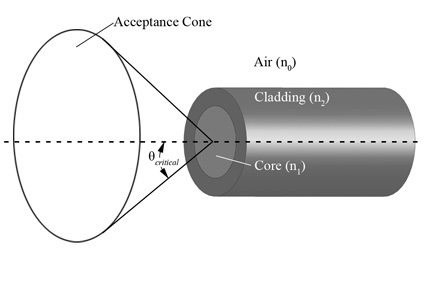 A closer three-dimensional look at the critical angle θcritical, reveals an acceptance cone as shown in figure 3. Incident beams that are out of the acceptance cone will not be totally reflected in the optical fiber. These beams are deflected into the cladding and are, thus, not useable for signal transmission. 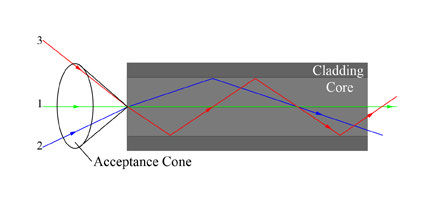 Signal propagation in an optic fiber follows different paths within the fiber core, cf. figure 4. If the waves are too close together in their propagation, i.e. the phase difference is too small, there will be interference. In the case of so-called destructive interference, the waves are cancelled. The wave can only propagate in case of constructive interference. Waves that can propagate are called natural waves or modes. What cable types are there and what is the difference? Fiber optic cable types can be divided in groups according to different properties: On the one hand according to their intended place of application, on the other hand according to cable structure. Indoor cables have a zero-halogen and flame-retardant outer jacket. They are not as robust as outdoor or universal cables and have, thus, a lower/narrower/smaller operation temperature range. Outdoor cables are highly resistant against environmental influence, like frost or moisture. They often have a PE outer jacket for UV protection. They are suitable for direct installation below ground, in cable trays or in conduit systems. One particular property of outdoor cables is their resistance against rodents. Reelable cables, or universal cables, are suitable for indoor and outdoor use. Reelable cables are halogen-free and, at the same time, robust and water repellent. With their flexible PUR jacket, these cables are particularly suitable for mobile applications. The fibers run bundled in a tube. Direct termination/assembly with connectors is not possible for these cables. Breakout elements need to be assembled in order to terminate/assemble connectors. Multi Loose Tube cables are highly flexible and lightweight. Furthermore, the cables are relatively thin in relation to the number of fibers contained within. 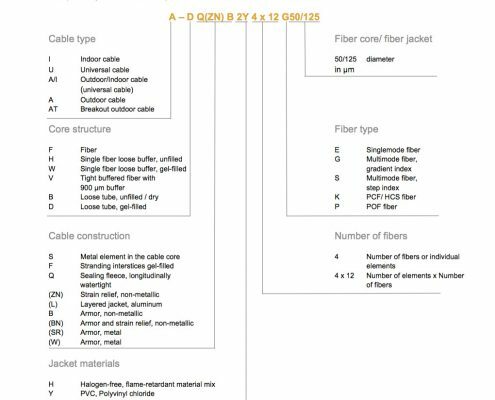 Every single fiber is protected with a cable jacket, the bundle is covered with an additional outer jacket. This makes the cable very robust, if a little rigid and inflexible. The double jacket makes it thicker and heavier resulting in higher fire load. Mini breakout cables do not have bundled fibers. A 900µm buffer protects the fibers. They are very flexible and still very robust. Mini breakout cables are suitable for direct connector assembly. There is always a combination of both property categories, e.g. outdoor cables may have breakout structure, mini breakout cables may be universal cables etc. In addition to the above-mentioned properties, there are other characteristics describing the cable type. Strain relief, for instance, may be non-metallic (aramid yarns or glass rovings) or metallic. 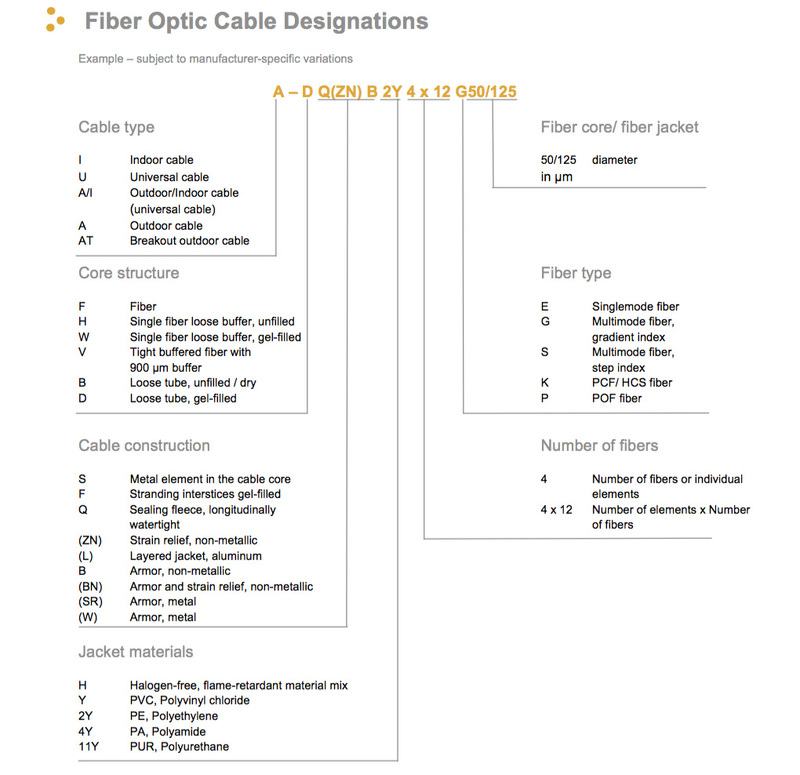 All important cable properties are specified in its labeling. If many modes propagate within a single fiber, it is called Multimode optical fiber. 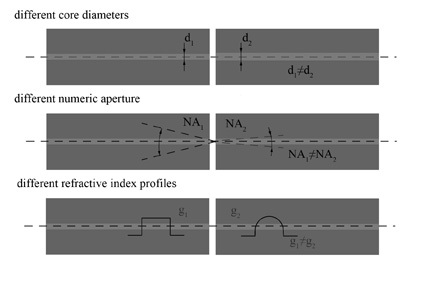 The number of modes depends on the core diameter, the numerical aperture, the refractive index profile as well as the transmission wavelength. Furthermore, there is the differentiation between step index profile and graded index profile for multimode fibers. 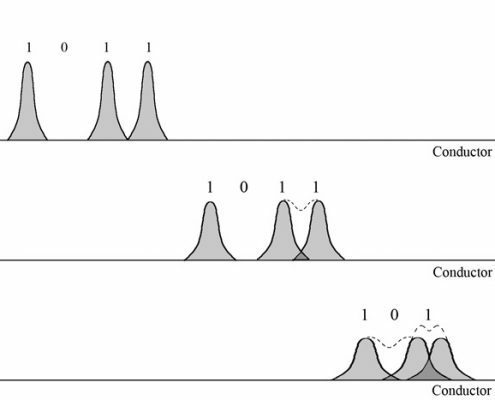 Many thousand modes may occur in a step index profile fiber. At different angles of incidence and at the same speed, they travel different distances, cf. figure 5. This causes the modes to be registered at the receiver time-delayed, leading to a protracted impulse also called dispersion. In a Singlemode fiber, the light is transmitted in one propagable basic mode, other modes are suppressed. Having only one mode in the glass core eliminates the disturbing influence of impulse broadening by runtime difference. The reduction to one propagable mode is realized by reducing the core diameter and the numerical aperture. Connectors enable detachable connections within a signal path. Plugging connections are subject to high stress. They shall ensure minimal loss for many plugging cycles, cause almost no reflection while being precise and sturdy. Attenuation is a general term for the reduction of the signal strength. Inserting an optical component such as a connector will cause signal attenuation. This phenomenon is called insertion loss. It is quantified in dB. 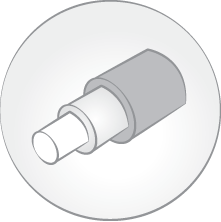 Flat connectors with air gap are mostly used for medical and instrument engineering. The FSMA connector is a typical example for this connector type. When the connectors are plugged together, the ferrules do not touch but form a defined air gap. Therefore, they have a higher insertion loss of 0.4 to 1.5 dB. Another phenomenon occurs at any glass/air transition surface: approx. 4% of the light beam is reflected back to the sender. The difference between inserted and reflected power is called return loss. It is quantified in dB. In order to avoid the glass/air transition surface and, thus, to reduce loss, the abutting surfaces of the ferrules are polished to a convex shape, rather than flat. Furthermore, the ferrules are pressed together with a defined spring load. This way, the air is pressed out of the contact surface creating a flat contact surface (PC, physical contact) with a glass/glass transition face. This results in reduced insertion loss (IL) of 0.1 to 0.7 dB. The typical return loss (RL) for plugging connectors with physical contact is 30 to 60 dB. As the returning reflected light may disturb sensitive senders, the abutting face of the connectors is polished at an angle of 8° in order to further increase the return loss. Due to the angle, light reflected back will be diffracted into the cladding. APC connectors (angled physical contact) are characterized by high return loss (>70dB). However, due to the convex polish, APC connectors also have low insertion loss values of 0.1 to 0.7 dB. In connectors with expanded beam technology, a lens at the end of the fiber expands the light beam. An identical lens in the connector of the receiving fiber focuses the light on the fiber surface again, cf. figure 9. Due to the lens system, there are no raised requirements towards surface finishing of the optical fiber and the beam is unsusceptible for small misalignments and dust or dirt particles. The typical loss for this connector type is 0.5 to 3 dB, due to the transition surfaces. Lens connectors are often available as multi-channel types. These are robust connectors designed for harsh environment applications (dirt, dust, moisture) e.g. at outdoor events like concerts, festivals or sports events. A typical example is the lens connector Eurolens. The term dispersion describes all effects that lead to impulse broadening or flattening during its propagation along an optical fiber. This may lead to increasing overlapping of neighboring impulses. 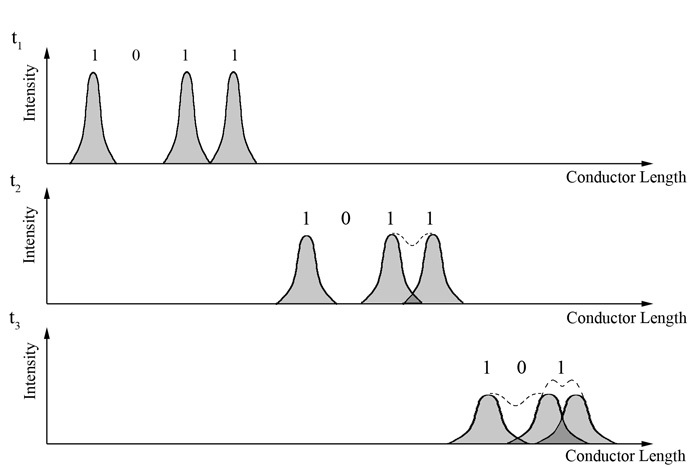 The receiver cannot distinguish the separate impulses, as shown in figure 11. Transmission errors are the result. The most common types of dispersion are mode dispersion and chromatic dispersion, which, again, consists of material dispersion and wave-guide dispersion. The bandwidth-length product (BLP) is a figure indicating the quality of an optical transmission system. It describes which bandwidth can be transmitted over a certain distance. The BLP is always specified for a length of 1 kilometer. Therefore, a BLP of 500MHz*km means that a bandwidth of 500MHz can be reached for a link length of 1 km, but only 250MHz for 2 km and 1000MHz for 500 meters. Due to the high quality of single mode fibers, this value will normally not be specified in favor of the attenuation values. The BLP of a Multimode OM4 fiber is 4700 MHz*km at a wavelength of 850nm. Absorption, scattering, radiation loss as well as loss due to macro bending are attenuation mechanisms. Impurities of the core material have a large part in absorption loss. Metal ions or OH-groups accumulate in the glass core leading to a decreasing signal. Due to continuous technological improvement, absorption loss mechanisms have become less significant. Besides non-linear scattering, Rayleigh scattering dominates in the normal operation of an optical wave-guide. Variations in density and refractive index in the glass material caused by increased placing of foreign atoms in the core glass are the reason for this phenomenon. The targeted placement of foreign atoms is called doping. It is used to lower the refractive index in order to reduce the effects of dispersion. As opposed to the physical loss mechanisms, loss due to bending can be directly influenced. Macro bends result from flexing the optical wave-guide. Bending a fiber leads to mixing of modes and to partial decoupling of modes into the cladding. The loss values increase for reduced bending radii. Micro bends are microscopic fiber deformations or irregularities in the fiber resulting in loss due to decoupling of light from the core into the cladding. They can occur during coating or stranding of the fibers to form cables. Large temperature fluctuations (-40°C to 90°C) may also result in stress and micro bending of the fiber. The pin-and-sleeve principle has proven to be the ideal construction for detachable optical connections. Plugging pins, called ferrules, are pressed together at a constant spring load in order to ensure physical contact. Both ferrules are guided in a slotted ceramic sleeve. Additional attenuation occurs at the transition between connector and coupling. This loss is caused by production deviations of the connector parts as well as by tolerance between connector and fiber. 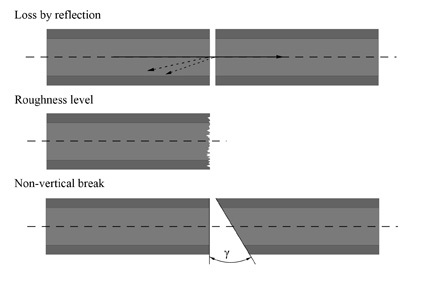 Further loss may occur due to the surface quality of the abutting faces of both connectors and due to the connection of two fibers with different parameters. Two types of loss can be distinguished: intrinsic loss caused by different fiber parameters, and extrinsic loss caused by mechanical tolerance. • Breaking not perpendicular to fiber. Figure 10 illustrates the specified loss mechanisms. The graphs illustrate the attenuation increase normalized to fiber diameter. Raised requirements to connector tolerances and fibers are particularly noticeable for Singlemode fibers (SM). Hence, guiding sleeves and couplings must be of the highest quality. It can also be seen that multimode (MM) connectors and couplings may have greater tolerance values. How to influence these factors? Chose Singlemode for longer link distances. Avoid too small bending radii when installing your transmission link. Bending resistant fibers reduce bending attenuation. Make sure to use the same fiber type for the complete link distance. Check and clean the abutting faces of the connectors before connecting.